Homemade is best! And, these bars are easy to make in 5 steps. This recipe makes 16 to 25 bars depending on how they are cut. Warning: chia seeds get stuck in your teeth!! Spread out the oats and coconut on one baking sheet and the hazelnuts on another. Toast in a 350 oven for 10 minutes. Peel and chop the hazelnuts. Set aside. * I use hazelnuts in this batch but almonds, walnuts, and cashews work too. Place all ingredients into a small pot and heat through. 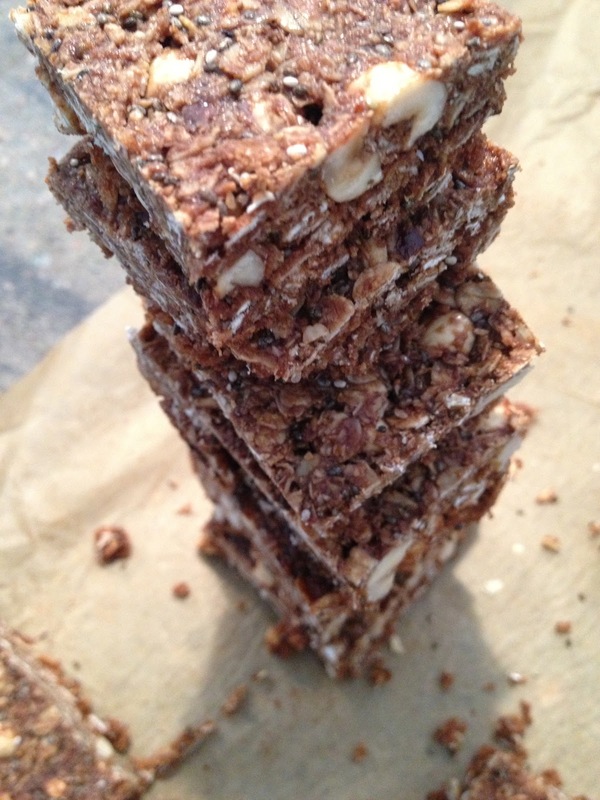 Add the flax powder, chocolate chips and chia seeds to the oats, coconut and hazelnuts. Pour hot mixture into bowl and mix well. Line a 9×9 baking pan with parchment paper. Turn mixture out into the pan and, using another piece of parchment paper on top, press down until evenly spread. Bake at 325 for 15 minutes. Cover and refrigerate overnight. Turn the baking pan over and pop out the granola. Cut into bars and wrap individually. Enjoy!